Multicentric reticulohistiocytosis (MRH) is a rare multisystem disease reported to respond to various regimens including prednisone, methotrexate (MTX), cyclophosphamide, and other immunosuppressants. We previously described a 55-year-old man with MRH followed at our institution for 9 years. He responded to treatment with etanercept, leflunomide, and prednisone1. Over the past 5 years since that report, the patient has remained in remission, and followup radiographs demonstrated significant healing of erosions in his hands. Prior to the initial visit at our institution he had been treated with MTX, hydroxychloroquine, prednisone, and chlorambucil with prednisone, with no improvement after 4 months. He had also been treated with alendronate 70 mg/week for osteoporosis prophylaxis. At his initial evaluation, he was taking 40 mg/day prednisone and 25 mg/week MTX. He had active polyarthritis and multiple skin lesions. Cyclophosphamide was added at 2 mg/kg. He had gradual improvement of skin lesions and arthritis over 8 months, and prednisone was reduced to 20 mg/day. Cyclophosphamide was discontinued due to gross hematuria. Etanercept 25 mg twice weekly was added to the MTX and prednisone and there was further improvement of both skin lesions and arthritis within one month. Over the subsequent 7 months, prednisone was reduced to 10 mg/day, but he experienced recurrent arthritis and skin lesions. MTX was replaced with 20 mg/day leflunomide. On this regimen he had complete resolution of the skin lesions and polyarthritis, which allowed a reduction of prednisone to 5 mg/day1. He attempted to stop etanercept after one year, but had recurrence of arthritis. Symptoms responded quickly to restarting medication. He discontinued etanercept after another year and leflunomide was stopped 1.5 years later. 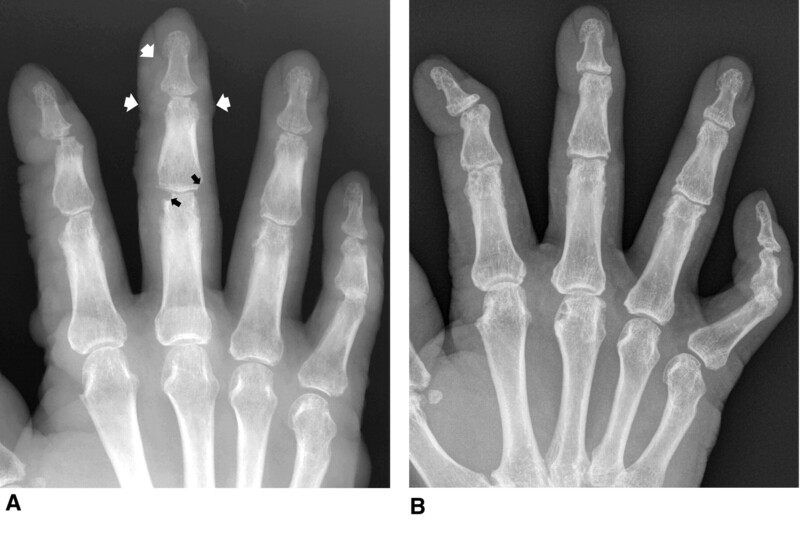 He has remained asymptomatic over 3 years, and followup radiographs demonstrated healing of the erosions in his hands (Figure 1). A. Initial anteroposterior radiograph of the fingers of the right hand shows small skin nodules (white arrows) and interphalangeal marginal joint erosions (black arrows), extending centrally from the periphery of the joints. Note lack of periarticular osteoporosis, proliferative changes, or periosteal new bone formation. Only a few of the nodules and erosions are highlighted. B. Followup radiograph 7 years later shows dramatic improvement and reconstitution of the osseous articular surfaces, with the most pronounced changes in the index and middle finger. Studies have demonstrated increased levels of tumor necrosis factor-α (TNF) in the synovium and synovial fluid in MRH, which has spurred interest in the use of anti-TNF drugs for treatment2,3. Several reports with anti-TNF agents have shown symptomatic improvement, although inconsistently1,4. Our patient went into symptomatic remission with a combination of etanercept, leflunomide, and prednisone and experienced healing of radiographic erosions. There appeared to be a filling of the erosions and a reappearance of articular surface with reconstitution of osseous architecture (Figure 1B). Several mechanisms could account for healing of the erosions in our patient. Bone loss is a consequence of disruption between bone resorption and formation. TNF-α has been shown to promote differentiation of monocytes/macrophages into osteoclasts by a RANKL-dependent pathway2. Osteoclasts cause bone resorption and erosive disease. TNF-α also inhibits osteoblastic activity, which promotes bone formation. Blocking TNF-α could be helpful in decreasing osteoclast activity and to allow normal osteoblast activity, promoting healing2. Increased levels of TNF-α have also been demonstrated in synovial fluid in rheumatoid arthritis (RA) and psoriatic arthritis5,6. Both have been treated successfully with anti-TNF drugs. RA studies have suggested healing of erosions with the use of anti-TNF drugs6. Responses of MRH to intravenous (IV) bisphosphonate treatment have shown improvement of joint and, in some cases, skin manifestations2,7–9. In one report, IV pamidronate decreased synovial monocyte/macrophage differentiation into osteoclasts in a patient with MRH2. Bisphosphonates are potent inhibitors of osteoclast activity. They have been shown not only to decrease monocyte/macrophage-osteoclast differentiation but also to promote osteoclastic apoptosis, as well as inhibiting osteoclastic resorptive activity, all of which could inhibit bone resorption and erosive disease2. In one study, the use of IV zoledronic acid in patients with RA treated with MTX reduced the number of bone erosions compared to patients treated with MTX alone10. Our patient was placed on an oral weekly bisphosphonate regimen at onset of illness for osteoporosis prophylaxis. He experienced a rapid clinical response in skin lesions and arthritis after initiation of etanercept. The healing of his erosive disease could be due to the effect of etanercept, which resulted in a symptomatic remission, as well as to the effect of longterm use of the oral bisphosphonate. Anti-TNF drugs and bisphosphonates can inhibit osteoclastic activity. Anti-TNF drugs can also inhibit synovial inflammation, which has not been demonstrated with bisphosphonates. Given the destructive course of MRH, a combination of an anti-TNF agent with IV or oral bisphosphonates should be considered in patients with severe disease in an attempt to induce remission, prevent joint destruction, and promote erosion healing. Appropriate malignancy screening should be performed prior to initiating anti-TNF therapy, given the association of MRH with malignancy1,7.
. Treatment of multicentric reticulohistiocytosis with etanercept. Arch Dermatol 2004;140:919–21.
. Osteoclast differentiation and bone resorption in multicentric reticulohistiocytosis. Hum Pathol 2006;37:1176–85.
. Multicentric reticulohistiocytosis: case report with immunohistochemical analysis and literature review. Arthritis Rheum 2000;43:930–8.
. Multicentric reticulohistiocytosis treated successfully with an anti-tumor necrosis factor agent: comment on the article by Gorman et al. Arthritis Rheum 2003;48:864–6. The effectiveness of anti-tumor necrosis factor therapy in preventing progressive radiographic joint damage in rheumatoid arthritis: a population-based study. Arthritis Rheum 2006;54:54–9.
. Alleviation of polyarticular syndrome in multicentric reticulohistiocytosis with intravenous zoledronate. Ann Rheum Dis 2005;64:1521–2. Successful treatment of multicentric reticulohistiocytosis with alendronate: evidence for a direct effect of bisphosphonate on histiocytes. Arthritis Rheum 2003;48:3538–41.
. Multicentric reticulohistiocytosis: a systemic osteoclastic disease? Arthritis Rheum 2008;59:444–8. Preliminary evidence for a structural benefit of the new bisphosphonate zoledronic acid in early rheumatoid arthritis. Arthritis Rheum 2006;54:1410–4.